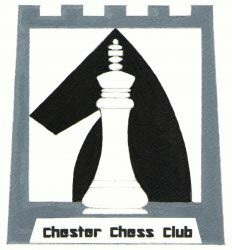 By Sunday several Chester players were in contention to win the league individual championship. In the morning round Colm Buckley beat Dave Bryan and Mike McDonagh won against reigning champion Chris Doran. In the final round Colm and Mike drew, joining Michael Vidler on 3 out of 4. In a tense blitz playoff Mike M quickly won a pawn against Colm but later blundered a piece as time ran short. A tricky manoeuvring game ensued between Colm and Michael V with Colm’s superior time management finally bringing home the win. 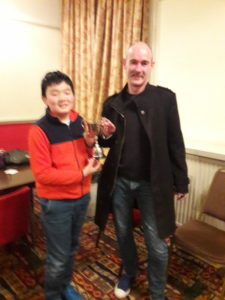 In the U130 section Jack Yang seemed on course to clinch the title in his final round game against Mike Whale. However, he ultimately lost his way in a fascinating to watch but extremely difficult to play knight v bishop ending. An Armageddon tie break followed with Jack taking the white pieces and winning on time in a superior position with just a handful of seconds on his clock remaining. Well done to both the winners and thanks to Tim Soar from Colwyn Bay for organising the event!